In his previous work, Nick Obradovich and his collaborators have found broad-scale impacts of temperature on human behaviors and wellbeing, demonstrating that emotional expressions are altered by the weather outside, that sleep is harmed by unusually warm nighttime temperatures, and that hot temperatures reduce physical activity rates (though mild temperatures increase them). They have also uncovered risks that environmental stressors pose to institutions of governance and the electoral process. His most recent paper, showing that climate change poses risks to mental health, highlights an additional, vitally important area of concern, which is likely to interact with each of the above areas. To answer that question, Obradovich, Iyad Rahwan, and their co-authors set out to examine whether some of the environmental stressors associated with climate change—hotter temperatures, longer-term warming, more severe tropical cyclones—relate to worsened mental health. Using publicly available meteorological data and mental health self report data from the Center for Disease Control’s Behavioral Risk Factor Surveillance Program (BRFSS), they found that hot monthly temperatures increase the probability of experiencing symptoms of poor mental health. They also found associations between longer-run warming and longer-run increases in the prevalence of self-reported mental health issues and discovered that an area’s exposure to Hurricane Katrina was associated with subsequent increases in prevalence of mental health issues. In short, they found empirical evidence that environmental stressors exacerbated by climate change have previously related to worsened mental health in the United States. As Obradovich’s research shows, climate change presents a grave threat to overall human well-being. From daily emotions to mild to moderate mental health problems to extreme consequences like suicide, the environmental factors that climate change is worsening harm our quality of life. And mental health is just one of many social risk areas. Poor mental health quality produces compounding and cumulative social costs; conversely, however, efforts to mitigate the severity of climate change will likely have compounding and cumulative social benefits. Proposed adaptations to the physical effects of climate change must be cognizant of the mental health risks it poses. Improving the quality of mental health care may also increase resilience, especially for those most vulnerable to the impacts of climate change. Biloxi, MS, August 14, 2008—This sea horse was carved from a dead tree in the median of Highway 90. 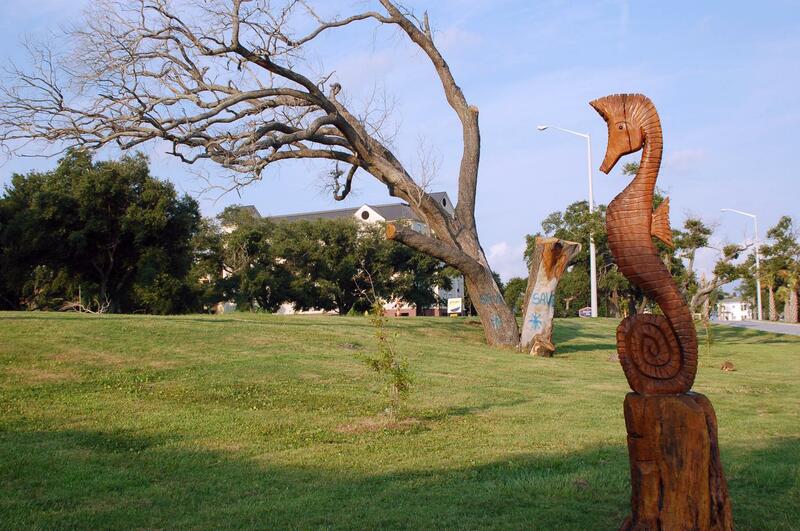 A local artist turned dead trees from Hurricane Katrina into art by sculpting sea animals and birds from them.